Just as I start to leave Manauga for Costa Rica I see a fully packed red KLR (Kawasaki 650cc) sitting in the parking lot of an internet cafe. I immediately investigate and meet Ryan, a 26 year old from Toronto who was on his commute to Malpais, Costa Rica to work with sea turtles. 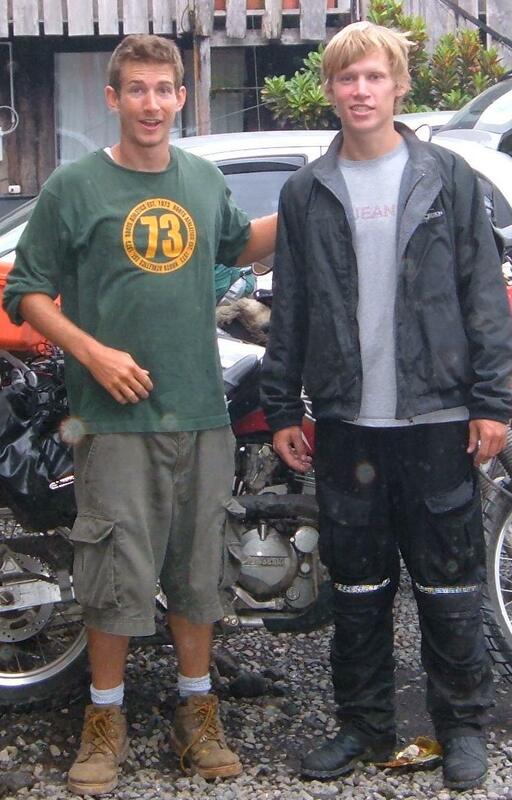 Ryan and I ride together for 2 days and explore Costa Rica. We tried to go to the Monte Verde rainforest, but the rain made an already treacherous road down right unbearable. We both fell a couple of times and than decided that we had had enough. On the third day, Ryan and I split ways because he was headed East and I was heading South to meet up with Wayne, a 58 year old from British Columbia (I found out Wayne was doing the trip at horizonsunlimited.com). Wayne is a nice easy going guy just like Ryan. Despite my long delays in putting on ear plugs, finding my keys, and packing my ghetto load Wayne had been paitent with me. He also rides a red KLR like Ryan´s (do resident Canucks only have one choice in dual sports).Like Ryan, Wayne is always worried about running out of fuel. KLR guys are very conscious about having atleast a half tank at all times even know their tanks are twice the size of mine. 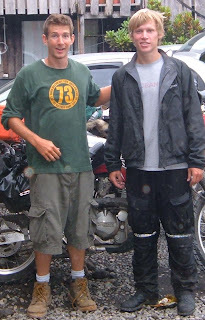 We are meeting up with Wayne´s current riding buddy Mike in Panama City. Apparently Mike is only 21, but is paying for this trip with money he made from his blogging site. Mike drives an F650 cs so I may be tempted to un-bolt his parts and swap them for my bent ones (just kidding Mike).